Dr. Merissa Fiddyment Mulé (pronounced like fiancée) is a native of Northern California. Moving to Virginia’s beautiful Shenandoah Valley after high school, she graduated with honors from Mary Baldwin College with a Bachelor of Science degree in biology. After marrying her college sweetheart, Michael, and moving to his hometown of Richmond, she attended the VCU School of Dentistry and received her Doctor of Dental Surgery. Dr. Mulé is a member of the American Dental Association, the Virginia Dental Association, the Richmond Dental Society, the Academy of General Dentistry, and the Richmond Association of Women Dentists. She takes pride in keeping her dental knowledge progressive by attending continuing education courses, study clubs and conventions. She enjoys practicing all aspects of family dentistry and welcomes patients of all ages to enjoy the lifelong benefits of a healthy and beautiful smile. 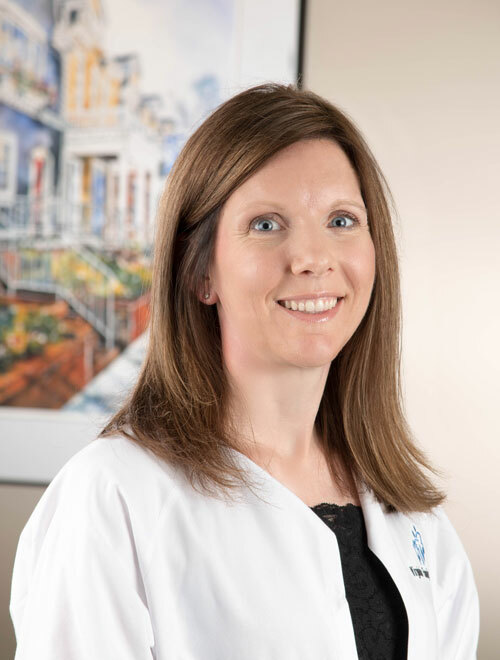 Dr. Mulé is actively involved in community service and takes pride in being able to use her skills to give back to those in underserved areas of Virginia through participation with the VDA sponsored Mission of Mercy projects and annual Give Kids A Smile Day. In her spare time, Dr. Mulé enjoys traveling with her husband, relaxing with family and friends, and treasuring as much time as possible with their young daughters, Emily and Riley.